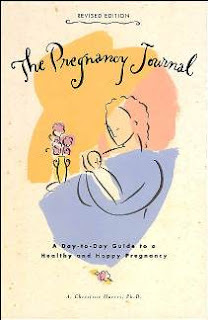 The Pregnancy Journal by A. Christine Harris, Ph.D. I'm 15 weeks pregnant now and I was excited to get my copy of The Pregnancy Journal for the MotherTalk blog tour. I had seen this book at bookstores before but just assumed it was a blank book for writing in while you're pregnant. Turns out, it has detailed daily entries explaining what is going on with the baby and what is going on with the mom's body, for the entire pregnancy. There are a few pages at the front with prompts for journaling about things like the planning of your pregnancy, ways you hope to be a good parent, and how the baby will change your family if you already have children. The main part of the book is divided into lunar months and weeks. Along with the baby and mom information, there is a lot of information about nutrition and health, along with occasional sections on pregnancy in other cultures and pregnancy comfort measures. Every week there is about a half page or so set aside for writing about whatever you want; there are also prompts for recording stuff like your weight, waist measurement, mood, and cravings throughout the book. The daily notes continue for two weeks after your due date, just in case you go over, and then there is another journaling section that has a few pages with prompts for writing about labor and delivery, and the new baby. With both of my previous pregnancies I found day-to-day pregnancy websites that I visited almost every day to get a little bit of information about my pregnancy. This book is sort of like those websites, only with much more information as well as all the places to personalize it with my own thoughts. I think it will be really cool to have it as a keepsake after this pregnancy is done. The fabric is a remnant from JoAnn's, just under a yard. I had to do some creative cutting and piecing (in the back) in order to have enough fabric to go around me. I don't think it looks too bad though. I made it a little bigger than I needed at first, then took it in, and had to adjust the waistband 3 times since the ribbing I used for it was stretchier than my pants. 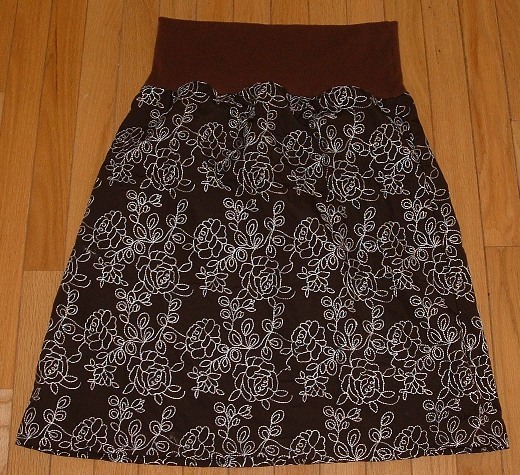 I think I have a good fit now, and I even made a pattern so I can make another skirt or two, only more quickly. I'm not totally thrilled with them. I do like the pockets and the piping, but they're too big. I need to take in the elastic in the waistband a bit more. 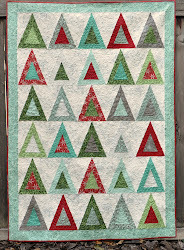 The pattern is a modified one that I used 4 years ago, the last time I was pregnant. Only the pants I made then fit me when I was 6 and 7 and 8 months pregnant, not 3-4 like I am now. If/when I make maternity pants again, I'll try the Ottobre pattern again. 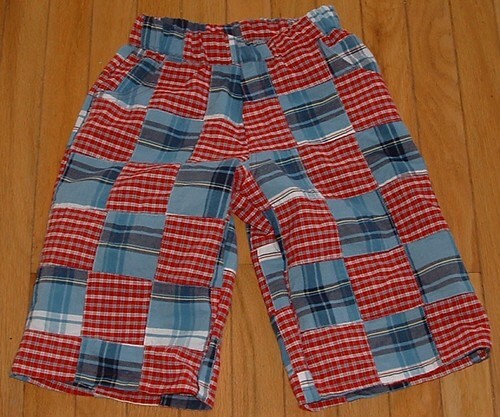 I finished up these shorts for my oldest plus a pair for my younger boy last week. This is the 3rd year I've sewn for them for July 4th. I'm going to buy them patriotic t-shirts soon to go with them. I got the prepatch fabric from Atlantis Fabrics and used the same Ottobre patterns (issue 2/05) as I used for their shorts last year. Same sizes, even. So, now it's on to maternity clothes.